I really despise those kinds of stories that start with a “Do you want to feel old today? Here’s something you’re probably nostalgic for, and it was a long time ago!” but, well, I’m going to hit you with one. 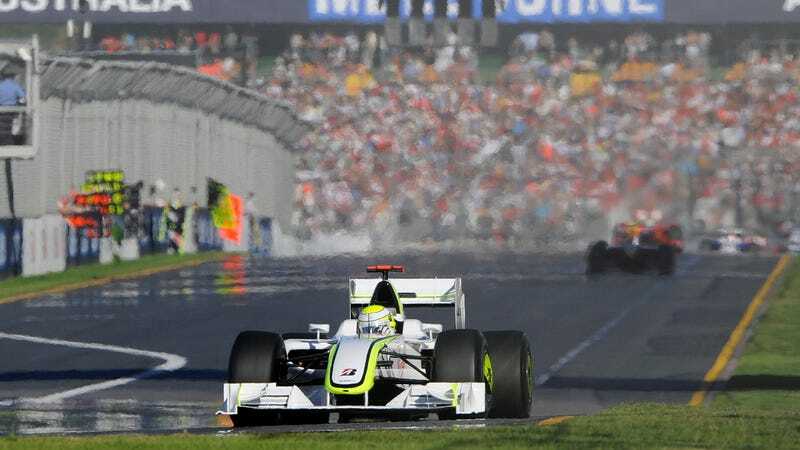 I don’t want to feel old any more than you do, but holy crap, Brawn GP’s season-opener surprise victory was ten years ago today. With brand new regulations on the forecast for the 2021 Formula One season, many fans—myself included—are ready for a complete shake up of the running order after seeing Mercedes at the front for what seems like the entirety of the modern era. Back in 2009, a full decade ago, the series introduced a new set of rules, and Honda’s exit from the series laid the foundation for a decade of competitive Mercedes. While the Honda F1 team had already built and developed a chassis for the 2009 season, the factory effort pulled out effective at the end of the 2008 season following three unsuccessful seasons continuing the old BAR team’s operations. Ross Brawn, renowned aerodynamicist, was confident in the car he’d created, exploiting a “blown diffuser” loophole, and picked up where Honda left off. The team had very little funding, and fewer sponsors, but were awarded a grid spot regardless. With Honda gone, and engine supply completely evaporated, Brawn turned to Mercedes Benz for motivation, and had to revamp the engine compartment and engine cover to optimize the space for the Merc lump. When Jenson Button placed the car on pole at the Australian Grand Prix (this date ten years ago) the whole F1 world sat up and paid notice to the new team. Knowing the car came from Honda’s death and the effort was low on cash, the expectation was that McLaren and Ferrari would continue their two-team battle that had raged through 2007 and 2008. When the season ultimately came down to Brawn versus Red Bull, it was clear that the new wide-wing and KERS regulations threw a wrench in the works. This was a battle of new aero rules, and Ross Brawn’s ability to model a car perfectly to the regulations. While Jenson Button ran as close to a perfect season as he could, and deserves every bit of applause for elevating his car to the top, the 2009 Brawn was nigh unbeatable. Following the success of 2009, Mercedes purchased the Brawn team, and set about doubling down on that success. After a reasonably down 2010, the team was back at the top for 2011, taking the fight directly to Red Bull. It’s fair to say Mercedes did more with the team than Honda could ever manage. Since 2009, only two teams have won the World Constructors’ Championship, Brawn/Mercedes and Red Bull. Take it back to 1999, and you can only add Renault and Ferrari to that roster. Maybe the 2021 regulations will be as big a shake up as the 2009 change was. I’m ready for it.